Mid-February marks the beginning of the best time to prune roses in the Northeast Texas area. Valentine's Day is an easy way to remember when this gardening task should occur. (You did promise her a rose garden, right??) An exception to this timing would be with the pillar or climbing roses that bloom on last year’s growth. These types should be pruned right after the spring bloom. But hybrid teas, grandifloras, floribundas, miniatures and shrub roses can all be pruned at this time. Annual pruning is an important part of rose culture. 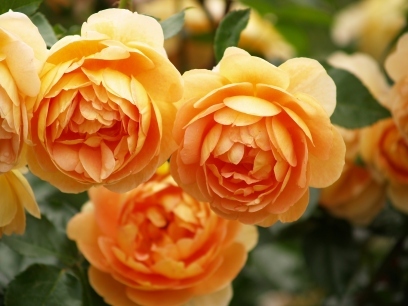 Pruning produces healthier, more vigorous rose bushes with larger, more attractive blossoms. Pruning also makes your bushes more compact and easier to care for in the home garden. 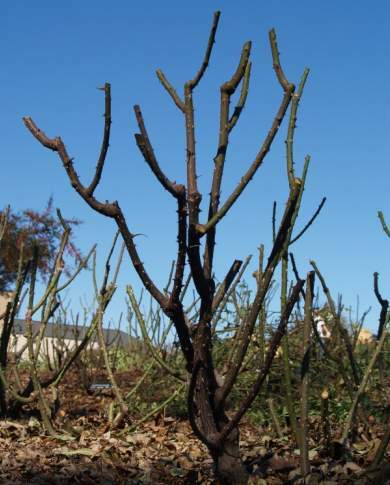 Pruning can also help reduce disease problems by improving air circulation and removing dead and diseased tissue. Health – by removing dead, damaged and diseased plant parts. Vigor – by removing “twiggy growth,” stems too small to produce and support a quality bloom, and encouraging vigorous, new growth. Structure – by giving the plant an uncluttered structure, free from rubbing canes and dense masses of foliage that reduce air circulation. Size – by trimming the plant to fit into a landscape scheme. Begin with the proper tools. A pair of sharp bypass or scissor-type hand shears is a must. Many professional rose growers, and most commercial growers in the Tyler area use Felco brand shears (pictures to the left). Anvil-type pruning shears, where one sharp blade makes contact with a flat opposing surface, will crush the cane, potentially allowing disease to enter at the injured location. A pair of loppers is also very helpful. Loppers give you the added strength and leverage to cut larger, older canes, and also the ability to reach in without getting torn up by the thorns. For very large cuts, a pruning saw is indispensable. All cuts should be made with sharp pruners. Dull pruners of any type make pruning difficult and also crush the cane as it is cut. Sharpen frequently with a fine file or sharpening stone. Heavy work gloves and long sleeves are also recommended to avoid the getting stuck. Another item to have on hand is a spray bottle containing isopropyl alcohol to spray your pruning equipment to help prevent the spread of diseases. Bleach is very corrosive and is generally not recommended anymore. Before starting to prune, examine the plant and imagine what you want the plant to look like. As you begin to prune, first remove all dead, diseased or sickly wood. Sickly canes tend to have a yellowish-green or brownish-green cast on the outside and may be shriveled. If you find two canes that are crossing and rubbing against each other, remove one of them. Most rosarians won’t have objections to the above suggestions. However, when we come to “how to prune”, we encounter a topic that evokes much (usually friendly put passionate) disagreement among gardeners. What follows are general guidelines that work for most rose growers. First, make all cuts back to healthy wood. When making a “heading” cut (shortening the length of a cane), make the cut no more than ¼ inch above a bud or bud-eye, sloping 45 degrees down and away from the bud. In other words, make a slanting cut, and don’t leave a stub (but don’t cut too close to the eye or bud either). The height to which roses are pruned is a personal choice. Some rosarians prefer to leave as much healthy wood as possible, but many will cut their hybrid tea bushes back to 18 to 30 inches, or prune back one-third of their length each year. 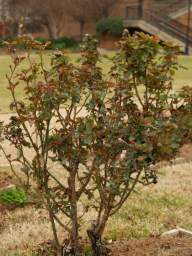 Miniature rose varieties should be pruned back to about 12 inches. Old fashioned garden or antique roses may need to be pruned a little differently, depending on the type and use in the garden. A few antiques and species roses are like some climbers – once bloomers – and should only be pruned after their glorious spring display. Others, such as rugosas and many species roses, may be best left unpruned to grow to their natural shape if the garden space will allow. Chinas and older hybrid teas should be pruned in much the same way as modern roses by removing twiggy, thin or dead wood and cutting back the stronger shoots to about one-third of their length each year, aiming if possible to encourage new shoots to emerge from near the base of the plant. This holds true for the modern shrub roses as well. 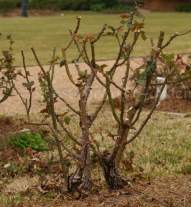 If your hybrid tea and grandiflora type roses have more than five canes remaining, cut out the other canes in the middle of the bush, making cuts flush with the enlarged graft union (for those types that are grafted). This will open up the middle of the plant, permitting better air circulation during the growing season. 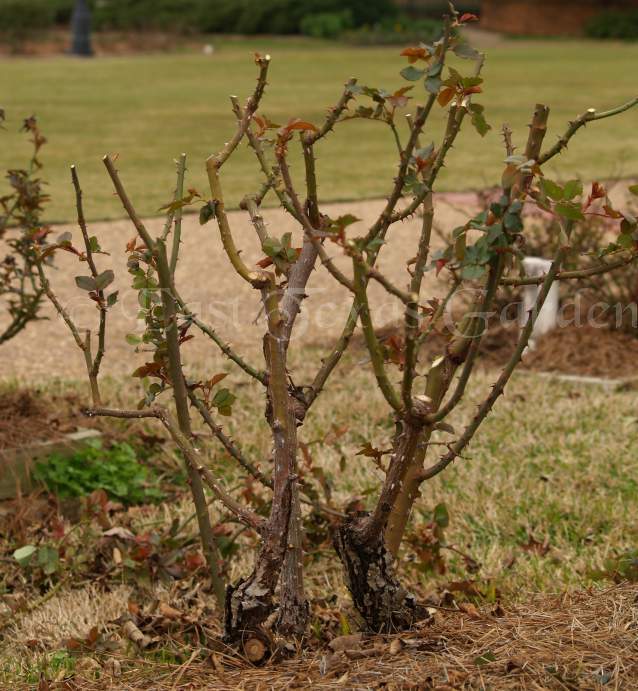 Keith Mills, Grounds Maintenance Manger for the Caldwell Zoo in Tyler, and former Tyler Rose Garden Supervisor, provided a handy rose pruning guide which will help guide your pruning cuts for the best blooming results. If you don't have any roses, promise her a rose plant - While it probably won't be blooming on Valentine's Day, you'll have a supply of blooms to offer for all kinds of occasions throughout the year. Every yard can handle at least one rose bush - just pick a sunny spot and it will reward you for many years.